You have probably read enough business books and seen enough parables on LinkedIn to understand that maintaining the ‘status quo’ will not win the day. In most industries and businesses, the mantra is “change or die”. In my industry (employee benefits for private companies under 5,000 employees), our world has gone from a handshake, middle-man arrangement to human capital advisory in less than 15 years. Along with these added complexities, we are seeing an unprecedented amount of industry consolidation. I am proud that The Benefit Company has drawn a line in the sand. We will continue to be privately held. Why? We are not afraid of change. So my question for you is: Are you providing your human capital team the resources it needs to change? This article focuses on small and mid-sized companies (generally, those with 50 to 1,500 employees). It is intended for two audiences: C-suite executives and Human Resource practitioners. For the C-suite, my hope is that you increase your focus on HR resources, or continue to devote an appropriate amount towards them. For HR practitioners, consider this is a call to action to help you keep your seat at the proverbial table. This graph illustrates the underlying challenge. The amount of HR resources allotted tends to follow company revenue — hence, the upward trend to 2007, the downward spike through 2009, and the gradual rebuilding afterwards. Regulations and government oversight have steadily increased for various reasons (ACA, FLSA, EEOC, HHS, OSHA, etc.). These trends reflect the crux of the challenge. When the economy turned south and revenues declined, so did the relative spending and focus on HR. 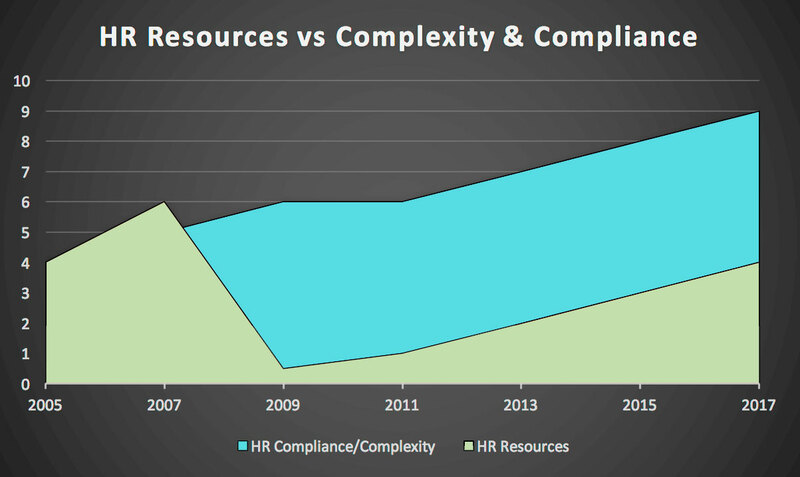 But since the recovery began, HR resources have not kept pace with increased compliance requirements. With these complexities continuing to rise, companies need to focus on how to effectively handle compliance while moving forward and creating a sustainable environment. The companies that have done this benefit from an enhanced workplace culture (plus likely giving their leaders better sleep at night). Those same companies have multi-year plans around compensation, compliance and — particularly for their largest spend — health care. Their bottom line is enhanced because they have empowered HR partners to be strategic, to focus on the difficult issues, and to make changes that can only be achieved with a leap of faith and effort. HR Director of 1,250-employee company wants to change how worker’s compensation and FMLA claims are taken in. He knows he needs training for managers, but instead must focus on impending shifts in FLSA overtime rules (which are currently delayed). 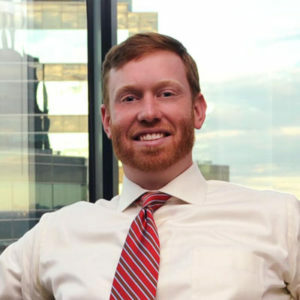 The legal issues of one FMLA claim going wrong could cost twice the cost of the technology to support FMLA, or of hiring someone to oversee benefits and absence management. HR practitioners must be able to make the business case for attacking both issues. The C-suite should also be receptive to short-term investments to tighten compliance. VP of HR for 450-employee company loves the idea of partial self-funding the medical plan and using a captive to achieve that goal. However, the department simply cannot afford any change right now. The VP faces too many pressing issues and is somewhat forced into accepting X% increases year-to-year that may or may not be justified. With the changing environment of health care and how it is financed, almost any company with more than 150 employees should seriously consider some type of self-funding. Not moving forward could cost tens of thousands of dollars over several years’ time while delaying a comprehensive strategy. VP of HR for a 300-employee rapidly growing company says she needs to replace their entire HRIS platform and payroll system. However, they also need to hire 25 new employees a month, so the VP cannot focus on platform change. Like the second scenario, the must do/must finish items are preventing the VP of HR from focusing on a multi-year strategy to keep the company ahead of the curve. There is no single answer for companies on hashing this out, but the first step in the process is acknowledging the issues. Change should not be something to fear, but many of us fear change if we lack the resources to effectively manage change. I can say with certainty that the word emphasized in italic, change, should not strike fear into the hearts of our HR community. However, I routinely talk to HR leaders who do not have resources to consider more complex long term strategies that require change. We should all be able to strive for the right change at the right time. I challenge the C-suite to empower your HR leaders to give them the ability to make those strategic long-term decisions that require change. I also challenge HR practitioners to “drive the boat” and make the business case for change. I guarantee your competitors will take that approach, because that is what we will advise them to do. 51 Years Ago, or Yesterday?